Honduras has been considered a dangerous place to travel for many years. But a popular cruise port on the Bay Island of Roatan has brought an influx of tourists to the country. 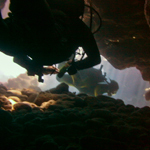 One of the highlights of my week long trip to Roatan was diving the swim-throughs (underwater tunnels and caverns). Two of my favorites and the biggest of these were at the dive sites called the underground and the dolphin’s den located on the north-east side of the island. I’m back underwater and this time I’m sharing the sea with some dolphins! Checking another item off the bucket list after visiting Roatan; one of the Bay Islands in Honduras. 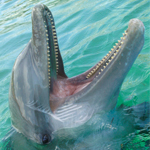 Ever seen dolphins doing tricks while underwater instead of from the surface? Check out the video inside!